Gregg Anderson, a captain in the USAF with a background in electronics repair, has been an avid Atari user since 1982 and upgraded to an ST about a year and a half ago. His roommate, a cat, often leaves messages on DELPHI under his username, and Gregg insists, "One of these days, I'll catch him at it." Faster than a speeding hard disk, more powerful than a 68000, able to leap tall memory stacks in a single bound. What is it? Only the latest utility from CodeHead software, G+Plus. So what's G + Plus? Just the nicest little GDOS replacement you could ask for. Created by the same folks who brought us Desk Manager, MultiDesk, Arc Shell and many other shareware and commercial enhancements for the ST, G + Plus is what GDOS was expected to be from the beginning but never was. What's GDOS? Basically, GDOS (graphics device output system) is the part of the ST's operating system that enables it to display and print graphics (such as complex CAD designs or graphics-based fonts like WordUp and Write) to various output devices. Originally, GDOS was supposed to be released as an integral part of TOS (the operating system). But something happened at either Atari or DRI (creators of GEM), and it was delayed until well after the 520ST hit the streets. Because of this, GDOS was later released as a software "patch" to be loaded and used only by those programs that needed it. But the delay of its release, added to a general lack of specific details on GDOS, and its inner workings, meant that a lot of programs were written without being tested for GDOS compatibility. Care to guess what that caused? You got it, lots of programs that wouldn't run worth beans with GDOS installed. G + Plus is what GDOS was expected to be from the beginning but never was. GDOS had (and continues to have) other problems as well. First of all, it has to be installed in the AUTO folder and loaded at boot-up. This means you have to reboot without GDOS each time you want to run a non-GDOS application—or risk bombing. Second is that GDOS requires that a properly written ASSIGN.SYS file be present on your boot disk (with a GEM/GDOS.SYS folder holding matching fonts and drivers), or it refuses to load. Once booted, you can't change these fonts and drivers, as GDOS will read them only once and remains set to the booted configuration until you power-off. Finally, GDOS often has a very adverse effect on the execution speed of programs on some STs. The exact cause of this is uncertain, but on some STs the speed of the entire system often slows down to a crawl, acting more like a C-64 than an ST.
For three years ST fans have asked Atari to rewrite the GDOS code to eliminate these problems, and for three years the general response has been less than overwhelming. "What speed loss?" or "We're looking into it over in Germany. We'll let you know if anything develops" have been the replies from Sunnyvale. Needless to say, these have done little to reassure heavy GDOS users in the Atari community. All seemed lost, until Charles F. Johnson and John Eidsvoog formed CodeHead Software and stepped into the picture. By dissecting the current GDOS, they found some clues as to what it did and how it did it. In doing this, they discovered the interference that was causing the speed losses and even found a way to re-read an ASSIGN.SYS file without forcing a reboot. Though similar to GDOS in its operation, G + Plus is not a derived product and is fully the creation of CodeHead Software. So what does this tell us? For one thing, it tells us there is a drastic slowdown when you install GDOS, around a ten-second difference across the board. It also shows us that in normal mode, G + Plus brings the overall operating speed back very close to that of non-GDOS ST systems. Most surprising of all is the effect G + Plus's "solid" mode has. Not only does it bring back the original speed, but it actually increases the speed of execution, making your program's boxes, windows, menus and graphic displays faster than you've ever seen them before. I was surprised to see that Turbo ST produces a slight speed loss in graphics operations, but the loss is fairly small, and the increase in text speed more than makes up for it. In fact, with both G + Plus and Turbo ST installed, my desktop acts more like it's powered by a 68020 than a 68000. "Normal mode? Solid mode? Now what is he talking about?" When you install G + Plus's desktop accessory, you're given two options for your display mode. The first mode is "normal." Normal mode retains all the visual operations we're used to on the desktop display. Solid mode, however, replaces a tiny part of this with a different system, though you'd probably never notice this unless you looked for it. You can best see the difference when you open or close a disk directory window. In normal mode you'll see the box dissolve and shrink away in a series of thin gray lines and boxes. These gray lines and boxes are actually just dotted lines drawn by the computer. Solid mode replaces these dotted lines with solid ones, nothing more, nothing less. The only visual clue you have (other than a marked increase in speed) is the black lines instead of gray ones as your windows open and close. I don't know about you, but giving up tiny gray lines is a small sacrifice to make for this type of speed improvement. Don't worry about loosing the use of gray or dotted lines in your application software though; G + Plus doesn't touch these. The second advantage that G + Plus offers is compatibility. As I mentioned before, GDOS has some major problems with most non-GDOS software: sometimes not letting it load, sometimes just crashing it when you start to work with it. CodeHead Software has managed to avoid this with G + Plus. I've been working with G + Plus for over a month now and have yet to find a program (auto-boot games don't count) that refuses to work with it installed. Best of all, some of these non-GDOS programs benefit from G + Plus's speed increase, though not as much as GDOS applications do. Charles and John went well out of their way to follow the rules when writing G + Plus. By doing this, they've just about guaranteed that it will remain compatible with all future GDOS applications as well as non-GDOS ones. The third, and final, major advantage of G + Plus is its ability to select and deselect different ASSIGN.SYS files without rebooting the computer. Like GDOS, G + Plus requires that you install it in your AUTO folder and have an accurate ASSIGN.SYS file that reflects the contents of your GEM/GDOS.SYS folder. 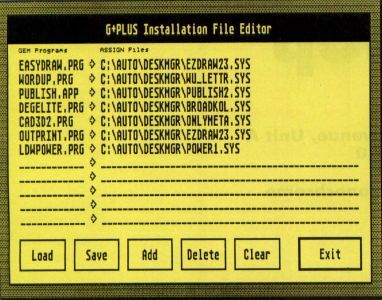 Unlike GDOS, however, if you've installed the G + Plus accessory file, it will allow you to access several ASSIGN.SYS files. It gives you the option of selecting which file you want loaded, either when booting or from the desktop. You still can't change ASSIGN.SYS files from within a program, but that's because none of the current GDOS programs will allow it. Assuming you've followed the directions in the manual correctly, G + Plus gives you several options for loading your desired ASSIGN.SYS file. You can select the ASSIGN.SYS you want when booting your application by pressing the Alternate key and double-clicking on the program's name/icon. This presents you with a box allowing you to load whichever ASSIGN.SYS file you want or retain the one currently in memory. Whichever file you've decided to use will appear in the G + Plus, accessory window display; so you'll always know which file you're working with. You can also manually change the ASSIGN.SYS file by calling the G + Plus desktop accessory from the desktop's Desk menu. This will then present you with the list of available ASSIGN.SYS files, and you can take your pick from any ASSIGN.SYS file available on your system. G + Plus can even "automate" the procedure for you. By installing the exact filename of your program and the path the program must take to read the desired ASSIGN.SYS file, G + Plus will automatically read and load the correct ASSIGN.SYS file whenever this program is run and delete any ASSIGN.SYS file currently in memory. All in all, a flexible system; one that takes most of the pain out of using GDOS. The manual that comes with G + Plus is short but thorough. It gives a brief explanation of GDOS, what it does and doesn't do in your system, the differences between it and G + Plus and a reasonably understandable description on using G + Plus's enhanced features. 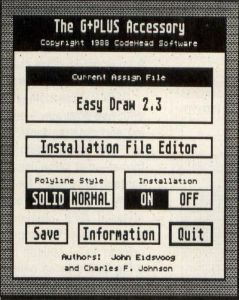 It also outlines the building of an ASSIGN.SYS file and even includes some "developer's notes" on accessing the inner workings of the program for the programmers among us. Needless to say, the program is not copy-protected (no utility should be). John and Charles are relying on us not to pirate G + Plus. It would be a sad comment on us all if this outstanding utility-producing pair had to call it quits due to piracy, like so many have in the past. Let's do the right thing here and support them. That way we can expect even more from CodeHead in the future. What more can I say? G + Plus seems to have not only taken most of the hassle out of using GDOS on a day-to-day basis, but has even increased the execution speed of GDOS applications as well. What Atari couldn't do in three years, CodeHead Software has done in six months—and with additional features to boot. I'm impressed with this program and totally hooked on it. My favorite feature of G + Plus is its faster program execution, but the added flexibility it offers for switching ASSIGN.SYS files may well be its most impressive feature. G + Plus is a must for any serious (or even casual) GDOS user, and at only $35 retail, it's a bargain as well. Run—do not walk—down to your local dealer (or call CodeHead at the number listed) and get this program. You won't regret it.